The Redmi Note 5 Pro and OPPO F7 represent some of the most powerful smartphones that both the brands have to offer. What’s even more interesting is that they both sport all new chipsets. 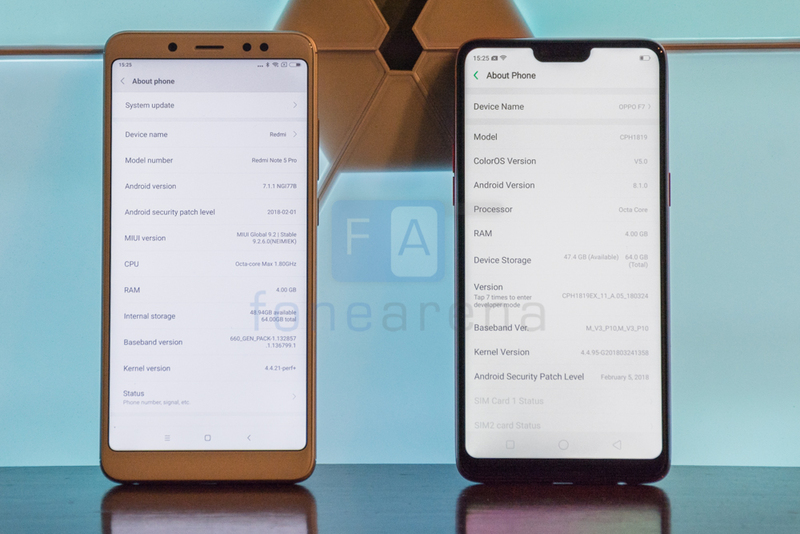 The Redmi Note 5 Pro with the Snapdragon 636 and the OPPO F7 with the MediaTek Helio P60, both smartphones are the first of their kind. We put the two through our standard test benchmark suite and here are the results. To put things in perspective, the Snapdragon 636 chipset in the Redmi Note 5 Pro has 8 x Kryo 260 cores clocked at up to 1.8Ghz. This is paired with the Adreno 509 GPU. The chip is built on a 14nm process. Meanwhile, the MediaTek Helio P60 sports 4 Cortex A73 cores and 4 Cortex A53 cores arranged in a big.LITTLE configuration. All the cores are clocked at up to 2.0 GHz. What this means is that high-performance tasks will activate the A73 cores while the A53 cores are responsible for maintaining battery efficiency. The GPU here is the Mali G72MP3. So how do the two phones fare? Let’s find out. 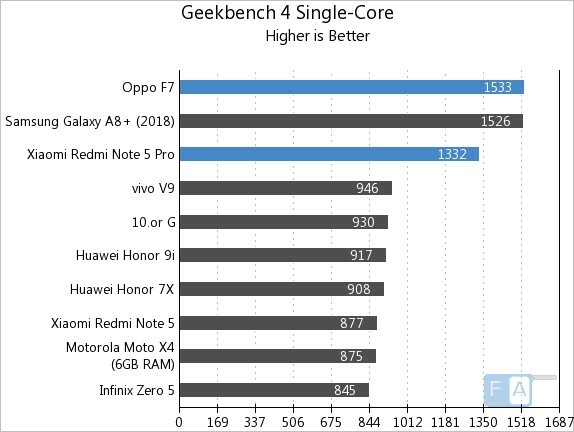 In the Geekbench 4 Single Core benchmark, the Oppo F7 scored 1533 points while the Redmi Note 5 Pro was slightly behind at 1352 points. Geekbench tests the single and multi-threaded performance of the chipset. 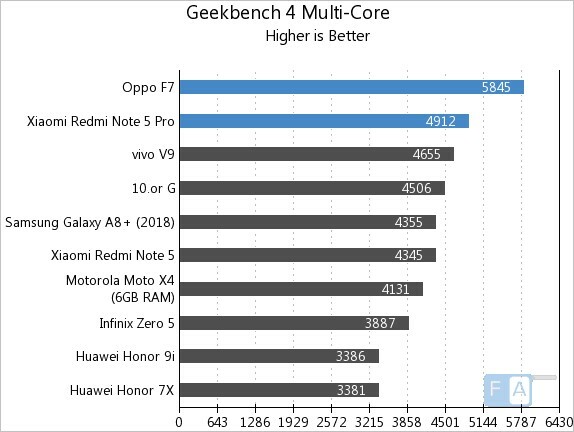 In the Geekbench 4 Multi-Core benchmark, the phone scored 5845 points compared to the Redmi Note 5 Pro that managed 4912 points. As the name suggests, this benchmark tests out multi-threaded performance. 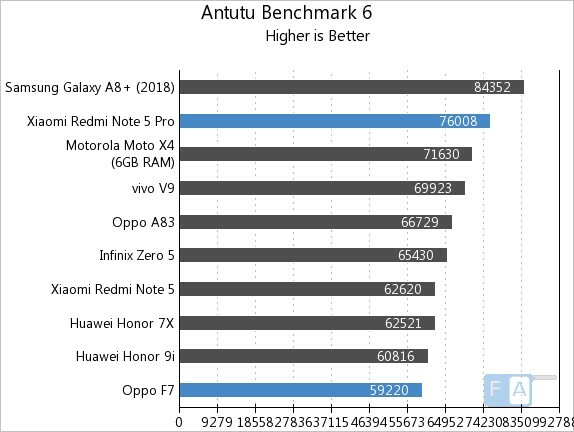 In AnTuTu Benchmark 6, the Redmi Note 5 Pro scores much higher than the OPPO F7. The Redmi manages 76008 points while the OPPO F7 is significantly lower at 59220 points. The AnTuTu benchmark is a comprehensive benchmark that tests out memory performance, CPU integer performance, CPU floating point performance, 2D / 3D graphics performance and more. 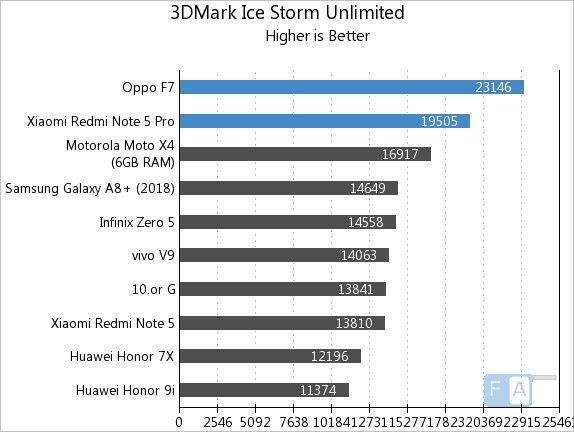 The 3D Mark Ice Storm benchmark tests out graphics rendering performance. The OPPO F7 scored 23146 points while the Redmi Note 5 Pro managed 19505 points. 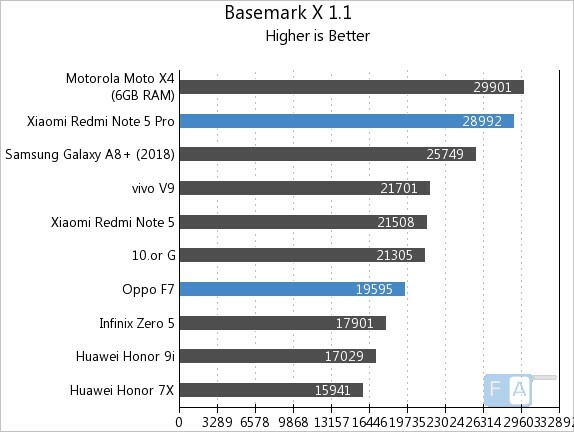 In the Basemark X 1.1 benchmark, the Redmi Note 5 Pro pulls ahead and scores 28992 points in comparison to 19595 points for the OPPO F7. 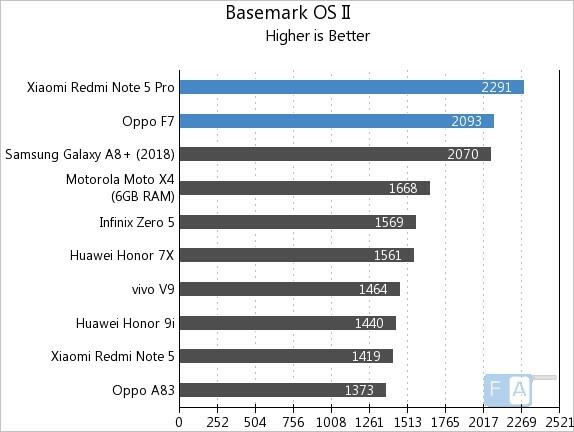 In the Basemark OS II benchmark, the Redmi Note 5 scores 2291 points while the OPPO F7 manages 2093 points. Across our benchmarks, the Redmi Note 5 managed to outscore the OPPO F7 in 3 out of 6 benchmarks and trails just slightly behind in the others. Both phones perform exceptionally well but it is interesting to see how the Redmi Note 5 Pro that costs much lesser than the OPPO F7 almost manages to keep up with the higher end device. Regardless, benchmark performance isn’t always indicative of the real-world experience. Check out our Redmi Note 5 Pro review for more on the device. We’ll have our OPPO F7 review up shortly.